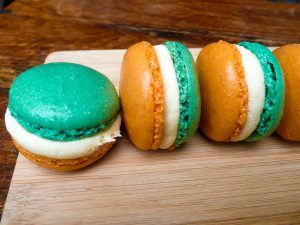 Happy St Patrick’s Day to all my Viewers on this coming 17th of March French Macarons wth an Irish Twist. In a stand mixer or using a hand mixer whisk the egg whites until stiff. Add the Castor sugar and mix again until glossy and thick. Sieve the icing sugar and almond meal together over the stiff egg whites and gently fold in, don’t over mix at this stage you just want the ingredients to start to combine. Divide into two bowls and add the green colour to one and the orange colour to the other. Fold the colour into the batter until it is nice and even in colour. Again you don’t want to over mix but enough to get an even colour. Place each colour into a seperate piping bag. Place the template onto a baking tray and cover with parchment /baking paper. Snip a fairly large hole in your piping bag and holding the bag upright pipe a macaron on each marked circle. Once you have finished one colour bang the tray firmly on the counter to remove any air bubbles. Leave the tray to one side for 20-25 minutes to allow a crust to form amd to help the development of the characteristic ‘foot’ of the macaron. Repeat the same process with the other colour. Preheat the oven and place the baking trays in the oven for 18-20 minutes. Keep an eye on them as you don’t want your macarons to brown and loose the great colours you have made. Once cooked remove from the oven and allow to cool completely. Whilst they are cooling you can make the Chocolate Ganache (https://youtu.be/U6ZAxAc1B54) and then add the Irish cream, Stir through and then whisk the ganache until light and fluffy. 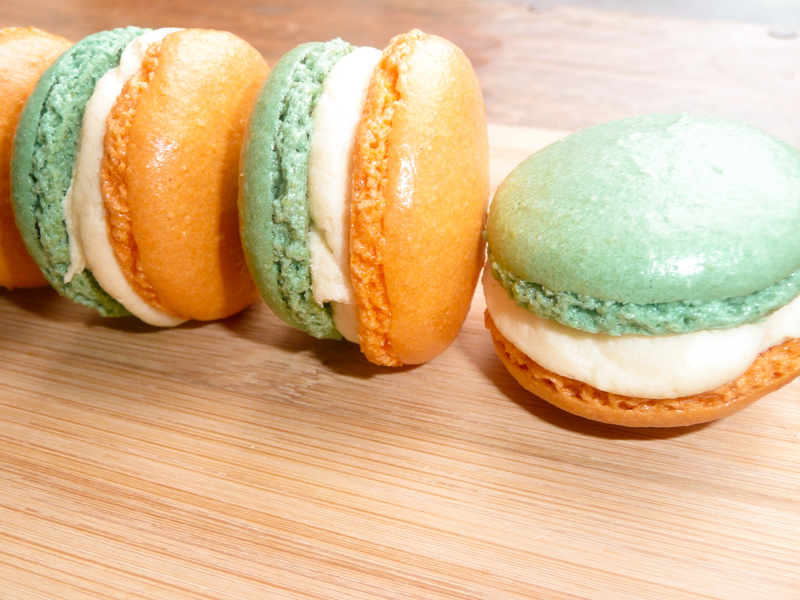 Place into a piping bag ready to fill the Macarons.